The Mt Jefferson Wilderness burned, in part, this summer. It wasn't a catastrophe. It wasn't a conflagration. The forest wasn't "destroyed". Fire is a natural part of the forest ecosystem. When we say, "We want the forest to be what it wants to be", part of that means that it wants (needs) to burn periodically. Episodic fire is not only desirable, but absolutely necessary to, the establishment, continuation and renewal of old-growth forests. The old-growth forests we love and admire today were born after a large natural disturbance, usually fire, but also sometimes from a major windstorm or massive outbreak of a natural native insect or disease pathogen. Most forest fires are caused by humans, rather than, as many believe, lightning. Human-caused fires should continue to be discouraged through education, enforcement, punishment and limiting access during extreme weather conditions that make human-caused ignitions more likely. Natural fires, started by lightning, should be allowed to burn as nature intends. The result of such fires will be in some cases the fires go out on their own, especially if weather conditions, fuel conditions, amounts and locations favor such. In other cases, the fires will burn over thousands of acres and perhaps for several weeks until the weather changes and the fires are naturally extinguished. • unburned (while in the designated fire perimeter), the stand was unaffected by fire. have their black backs to help hide them from predators as they feast upon insects found in burned trees. Some wildlife species need or prefer more open conditions afforded by fire. 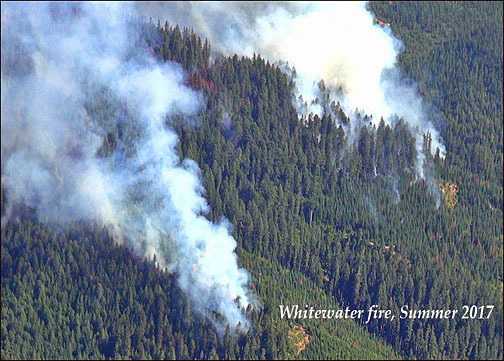 Within the proposed Douglas-Fir National Monument, fire is infrequent; on average, fire affects a stand of trees only once in several hundred years. What makes old-growth Douglas-fir forests so magnificent is that large accumulation of living wood. It rarely burns because the old-growth trees have very think and fire-resistant bark. You’ll often see char marks on some very old and very living trees. Forest fires are not only necessary and desirable, they are inevitable. While lots of money is spent in support of a fire-industrial complex that makes money “fighting” fire, the money is mostly wasted. Rapid initial attack early in the fire season does puts out many fires, many of which that would go out anyway. Even massive allocation of humans, motorized equipment, water and chemicals during a large fire driven by high winds and low humidity will not materially affect the outcome of the fire. Such fires are extinguished by nature as the weather changes, rather than by human action. Money “fighting” fires is better spent on other forest, recreation and wildlife management. There are very few buildings within the proposed Douglas-Fir National Monument and not all of them are dwellings. If proper steps are taken to make a building highly resistant to fire, in all likelihood the building will survive a fire. However, if these steps are not taken, then no amount of fire-fighting—even it did substantially affect large wildfires—will be effective to prevent the building from burning. Buildings need to have non-flammable roofs, screens on vents to prevent embers from getting inside the building, fire resistant siding, non-burnable wooden decks. Decks act like kindling to set the building ablaze. Buildings also must have a defensible space around the building where vegetation is managed to prevent any fire from getting close to the building. This defensible space is usually on the order of 100-feet, and perhaps to 200-feet if the terrain is very steep. The primary responsibility (and best chance) to keep a building from burning is that of the building owner. Campgrounds can be problematic because they draw people, and people start most fires. People also want to camp in a natural setting and defensible space management appropriate for buildings is not so for campgrounds. It is best that the outhouses be non-wooden structures and money be available to replace the burned picnic tables after the inevitable fire. 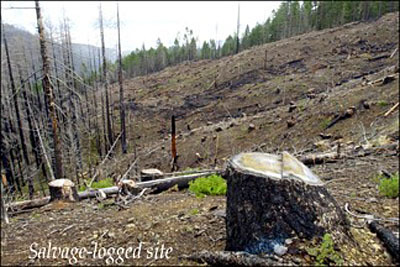 It has long been standard practice by the Forest Service, Bureau of Land Management and the timber industry to clearcut (in this case, called salvage logging) a forest affected by forest fire so as to both capture the economic value in burned trees before it is reduced and to re-establish conifers as soon as possible. A burned forest is a stressed forest and does not benefit from the additional stress of roading, clearcutting and artificial planting. Salvage logging followed by planting of a single species of tree results in the elimination of a very ecologically vital and desirable stage of forest development: complex early seral forest (ESF). In an older (mature and old growth) forest, fire (also wind, insects, disease and the occasional volcano) can result in a major disturbance. If left to nature, the disturbed stand becomes complex, early seral forest, that is, the first stage in the succession of a forest. In this case, grasses, wildflowers and young shrubs begin to grow. ESF can last decades from when conifers no longer dominate the site (due to disturbance) until conifers again dominate the site (young forest). An early seral forest is extremely biologically diverse. As this habitat is made up of many plant species, it is attractive to a host of wildlife species, from birds to mammals to amphibians to mollusks. This is what the forest does when left alone, and what it needs to do if it is ever to achieve old growth status. Salvage logging, on the other hand, precludes the natural succession to old growth conditions.